We're excited to announce the release of a new program, that will be integrated into the site and make the installation of mods much more in­tu­i­tive. Normally, when you install revisions, you download the file, extract it (if you have the program installed for that) and then you move it into your SFM folder. This process takes ages and it sure is ugly. Sometimes you can't find mods and then you search for them hours on hours. Also how will you repair mods, if you accidentally delete a file? Well, we have worked on this problem, and we focused our goal on minimizing the time between clicking "Download" on a resource and having it available for usage on SFM. Our solution is a small program that will be integrated into the site with the help of a new button, that will be displayed alongside the download button. After you install the program you can instantaneously install mods. And it will keep track of what you have installed. You can easily verify that your mod files are working and you can repair files when needed. After downloading the program extract the archive somewhere and start setup.exe. Install the program and then confirm the UAC prompt, to install the custom application protocol which is used by the site to talk to your computer. The first time you open the program it will ask you where your Source Filmmaker directory is located. 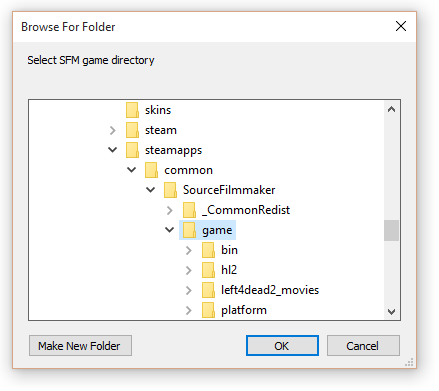 You need to select the game directory, that is inside the Source Filmmaker directory. You can go to any resource, or revision, like this one, and then click the button that says "Mod Manager". If your web browser asks you to confirm that you want to launch an external application, choose yes. If nothing happened, then it could be that you didn't install correctly, or that your web browser has blocked us (please write to me directly on Twitter or by email if this happens). If everything worked correctly the program should automatically start and download and install the mod you requested and then close itself. Sometimes the program complains that it can't parse the archive, this only happens if the mod creator didn't create a separate materials/models/etc. folder inside the archive. If that happens please write a comment on the resource to let us know and we'll fix (probably). This does not work with DeviantArt-only submissions. Because there is no reliable way to download files from DA as it has no API designed for access downloads. There are multiple filetypes that could occur, we only support ZIP. And why it wouldn't make sense at all: we don't want to be a DeviantArt-mirror. Even if it's hard for a lot of people, creators will have to start posting the downloads directly on our site to get these features. If you launch the program on your Windows machine with no arguments, you'll get a little menu. All other inputs lead to exit. In case of unexplainable errors and crashes you can contact us. Simply state the issue and please include the log file. The log file is inside the directory of the program. The easiest way to get there is to open Task Manager, right click on the process and select "Open file location". 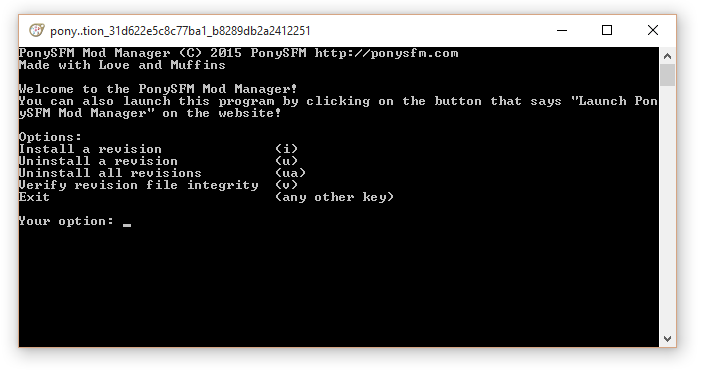 The log file is called "ponysfm_mod_manager.log"
If you want to change your SFM Directory or accidentally selected a wrong one, then delete the PonySFM folder in %LOCALAPPDATA%. Please send a mail to gian.sass@outlook.de, alternatively you can write to me on Twitter too, @Nuke928.